Speakers range from not being able to handle even a drop of water to being able to be fully submerged in water for several minutes. Do you plan to take your speaker outside? To the beach? To the pool? In the shower? Then you definitely need to verify the level of water resistance before purchasing. You can tell the water resistance by the IP rating—the higher the rating, the more resistant the speaker is to the elements. For reference, the first digit refers to dust protection and the second digit refers to water protection. It reads as: IP68. Anything higher than IP66 will be dust- and splash-proof, meaning it can handle some contact with water, but cannot be fully submerged or soaked. Battery life for Bluetooth speakers is measured in milliampere hours (mAh). Manufacturers will report the battery life of a speaker in the average number of hours it takes to empty from a full charge. Keep in mind this number is based on medium levels of usage. If you play the speaker on full volume, it will drain the battery faster. Some specialty features like using the speaker to charge your phone or casting an LED light show will also drain the battery faster. The manufacturer reported number is just an estimate, and may be slightly different based on your usage. It’s also important to consider is the type of battery. Rechargeable lithium-ion (LI-ion) batters are ideal, but some speakers only take standard or rechargeable AA/AAA/C/D batteries. You may even find Bluetooth speakers that recharge via solar power—great for outdoor use! Rank: #49 out of 329. Sonos One is a very popular and one of the most expensive options. It's in the top 3 bestselling bluetooth speakers and has dozens of popular alternatives in the same price range, such as JBL Pulse or Harman Kardon Aura Studio 2 . 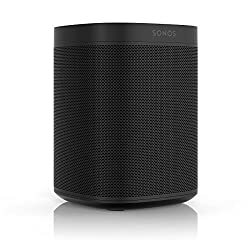 Sonos One is $90.20 more expensive than an average bluetooth speaker ($49.99).